Quickly clean interior plastic, vinyl, rubber, etc. The P&S XPRESS Interior Cleaner is an interior cleaning product that can do it all! Use it to clean anything - plastic, vinyl, leather, rubber, and metal. This comes in handy for places such as the doors, dashboard, consoles, doors, seats, trim and so much more. It gently cleans all of those areas to remove any dust, dirt, oils, while not leaving behind any residue. Use the Quick Detailer Interior in between full details or for some quick touch up work. Grab a bottle of the P&S XPRESS Interior Cleaner and make quick work of interior cleanups! 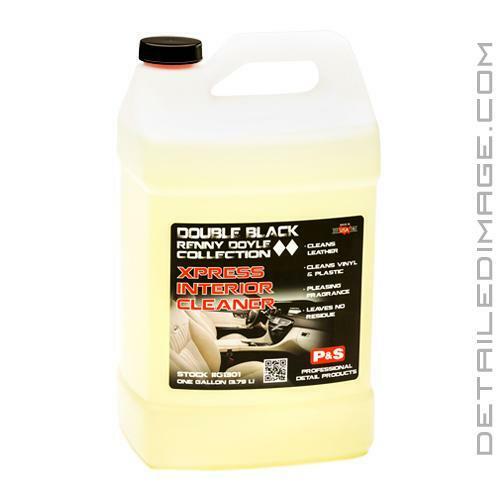 Perfect for cleaning all surfaces of the interior of vehicles without risk of damage. XPRESS Interior Cleaner was developed for use on leather, vinyl, and plastic. This incredible product cleans without drying, discoloring or damaging the cleaning surface. Cleaned surfaces will feel clean and residue free. Designed for express applications, XPRESS Interior CLeaner cleans dirt, grease, oil and other interior traffic marks that accumulate through normal use. Spot test is always recommended when working on interiors. XPRESS Interior Cleaner may be used straight or diluted 1 to 1 with water. Spray apply a generous amount of XPRESS Interior Cleaner on area to be cleaned. Scrub if necessary with towel, soft brush, or soft scruff pad to aid in the cleaning process. Once cleaned wipe off remaining product. XPRESS Interior Cleaner leaves surfaces in a natural state and does not require dressing. However if dressing is desired use L61 Leather Treatment to create a quality dressed appearance. Just want to let you know how great your customer service is.